To celebrate the triumph of the London 2012 Olympic Games and Team GB’s success in competing, this week’s featured poster is Boat Race by Andre Edouard Marty (1933). Team GB gained a total of nine medals in rowing (four gold, two silver & three bronze!) making it our most successful Olympic rowing attempt ever, surpassing our success back in 1908 when Great Britain also hosted the Olympics. We have however won gold in the rowing at every Olympic Games since 1984 and have been the most successful rowing team at the last two Olympics. This poster was specifically designed by Marty to advertise our annual opportunity to witness British rowing in London, the Boat Race between Oxford and Cambridge universities which has taken place on a four mile stretch of the Thames annually since 1856. 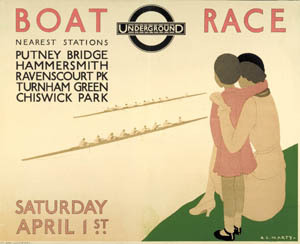 This poster was part of a set of panel posters he designed for London Underground all for special sporting events; the outcome of this commission was unsurprisingly stylish given that Marty was a leading fashion illustrator in his time, seeing his work published regularly in Vogue, Harper’s Bazaar and Vanity Fair. As London takes a break from all the excitement until the Paralympic Games begin on the 29th August, we’d love to hear your experiences of the last fortnight, what have been your highlights of the London 2012 Olympic Games?